Design by Alex Bergtraun, Studio Bergtraun ( or 510/652-0612). Before the remodel, the dining room had limited storage space and no buffet area; narrow doorways made entertaining difficult. Now, the room benefits from a built-in sideboard and wider, open doorways. Adding the sideboard yielded four square niches. The Pauleys hired Chehalis, Washington, painter Robert Flanary () to fill those slots. New cabinets were constructed, while old ones were repurposed. 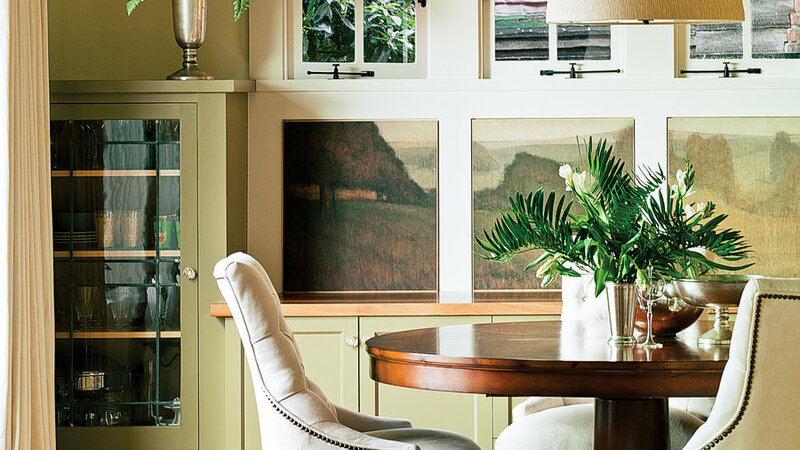 Originally located on another wall, the glass-door cabinets now bookend a madrone-topped sideboard. New glass knobs from Omega Too () match the originals. The new natural palette links the indoors with the outdoors. Wall paint is Twisted Oak Path #226, and the sideboard is Cleveland Green #1525 (both from ). 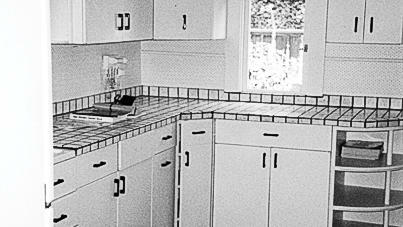 Before, the kitchen had old-fashioned appliances and sparse storage. Furthermore, the room felt cut off from the rest of the house. Besides adding (finally!) a dishwasher and a garbage disposal, the Pauleys upgraded other appliances (including a refrigerator that opens, sensibly, toward the sink). They also introduced such innovations as concrete counters. To keep the kitchen from feeling too new, MaryJane installed era-appropriate fixtures and fittings (pendant lights from Omega Too, ; cabinet hardware from Belmont Hardware, 510/548-5757). A new color palette softens the look. 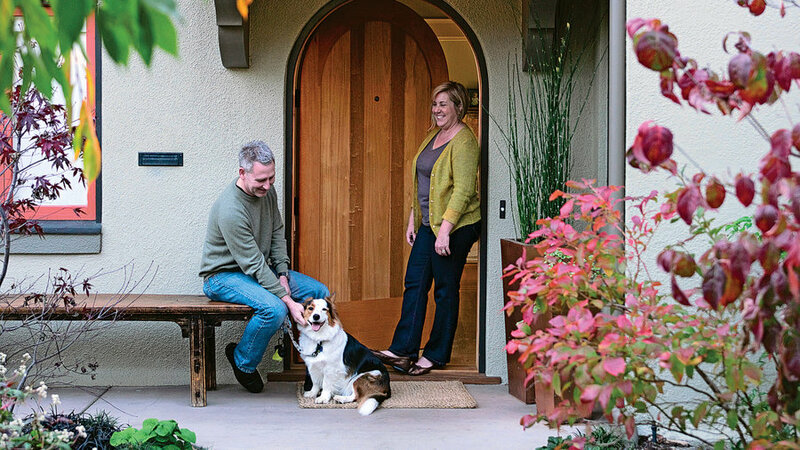 Creamy whites brighten the earth-toned Craftsman palette while greens keep it tied to nature. Cabinet paint is Acadia White #OC-38 (); the island picks up the dining room’s Cleveland Green. In addition, glass tiles add subtle pops of color: Lucido in Coal, Ivory, and Chalk, plus Satinato in Papyrus (all from ). 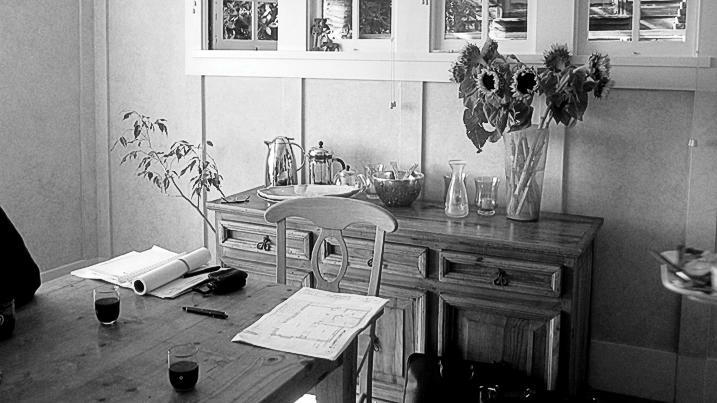 The breakfast table—its top is salvaged madrone—triples as a prep station and a desk for doing homework. Bonus: One end of the table has three drawers for still more storage.